That a prince of the Church should engage in this kind of moral preening at the expense of our former Holy Father -- who truly was and is a Holy Father -- is revolting. The mark of a truly great ascetic is that he humbles himself. Christ humbled Himself. However, it is not for us to humble Him. When St. Alphonsus Liguori was a bishop, he drastically cut his household, got rid of the sumptuous furnishings, and dispensed with fancy modes of transportation; but I have never read that he went in for mediocrity in the liturgy. Ven. Pius XII only wanted to be a simple parish priest but accepted God's will that he be exalted in the Church, and resigned himself to all that went with that. He was hard on himself, practicing mortifications and penances, such as sleeping on the floor, on top of working long hours. But he did not shrink from pomp and ceremony, because those things came with the office, he saw it as his duty to conform to its requirements, and they were for the glory not of him, but of God. As for Benedict XVI, shy and retiring by nature, it is clear that the public side of his ministry as Pope was an ordeal that he endured out of a sense of duty, and the idea of any vanity in him is preposterous on its face. Therefore, it is equally clear that he revived many trappings and ceremonies, not to please his own ego, but, firstly, to give God the honor He is due; and secondly, in an effort to lead his flock out of our shameful love affair with banality, and teach us that in fact beauty IS truth, and truth beauty. I hope that our new Holy Father, Francis, grows into his role as pastor of the Universal Church, accepts its incidentals, and continues Pope Benedict's work of restoring beauty to its rightful place in Catholic life -- right after putting an end to vulgar moral exhibitionism at the expense of his holy predecessor. This is the first time I've read those tweets and I'm horrified - but not surprised. Mahony has never been known for prudence in behavior or speech. I have purposely avoided any speculation about Pope Francis. The instant and seemly over-the-top adoration of him does worry me though. But, I've always thought cult like hysteria over any individual like politicians, Hollywood types, and religious figures is just plain weird. 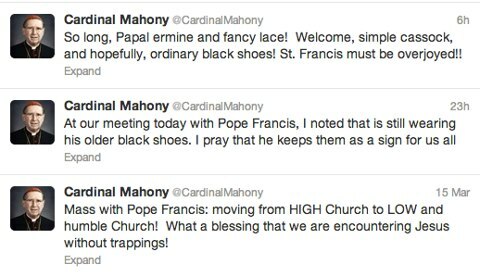 After building that cathedral in L.A., Mahoney has the gall to give Benedict XVI grief over vestments? Cardinal Mahoney, playing Judas before all the world during Passion Week. Many at my parish are traumatized today. There is an ugly, anti-liturgical movement rearing it's evil face already on the heels of Pope Francis' election. I did not know priests could commit liturgical abuses during the TLM - today we not only endured that, but were subjected to a diatribe admonishing us (who attend the TLM) for criticizing the NO and extolling Vatican II for [no embellishment; this is what he said] - "adapting the Liturgy to the modern world"! One woman broke down crying; many left Mass saying they felt as though daggers had stabbed us in the gut. I pray Pope Francis will not discard the beauty that Benedict XVI restored to the Papacy and the Liturgy... I pray he will defend the legacy of His Holiness Benedict XVI. Very well said. 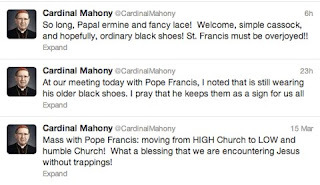 I am repulsed by what Cardinal Mahoney is spewing out. He really needs to be placed in a monastery far, far, away. Thank you for the post! Very well said. Sorry if this is posted twice. I am repulsed by what Card. Mahony is tweeting. He needs to be sent to a monastery far,far away.